Joyous Wolf Release Music Video For Mississippi Queen Reviewed by David Zeck on November 15, 2018 . I said it once, and I’ll say it again: Joyous Wolf is the Salvation of Rock n’ Roll. In a time where bands have become lazy and complacent, just sounding like everyone else, there is Joyous Wolf to shake things up. The band is constantly touring, this round they even opened for the legendary Slash. Now the band has released a music video for their rendition of “Mississippi Queen”. The video premiered exclusively on Loudwire yesterday and has made waves across the internet since, not surprising considering the band takes this classic and freshens it up with their own unique style. The performance-based video clearly pays homage to a band that inspired them and boy do they do just that. Vocalist Nick Reese nails it once again with raw vocal emotion, The band also adds a meaty flare to the track with Blake Allard and bassist Greg Braccio pulling off the riffs beautifully. If you like the track it’s available now via Roadrunner Records Here! 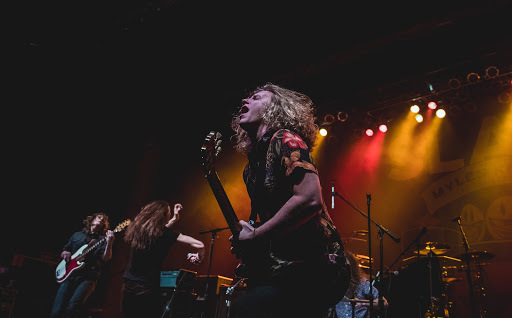 There is also a few more chances to catch Joyous Wolf live this year, which I highly recommend since they’re one of the most exciting new bands on the planet. See the rest of their touring schedule below.